WTOP's Rob Woodfork says Kyler Murray's height, weight and hand size — yes, hand size — are irrelevant to his prospects as a franchise NFL quarterback. The highlight of Day 1 of the NFL Scouting Combine wasn’t some thrilling display of agility or feat of strength in the bench press. It was a simple measurement. Kyler Murray, the reigning Heisman Trophy winner, measured in at an eighth of an inch over 5-foot-10 and weighed in at 207 pounds, which (momentarily) ends the speculation over whether he’s too small to play quarterback in the NFL. Oh, but if you wanna get nuts, let’s get nuts! These players get their hands measured too! And NFL teams place a ridiculous amount of emphasis on this, to the point that a former GM still wails about a late round pick whose game was trumped by his lack of hand size. Hey, NFL. Just stop it. One could put together a playoff-caliber team of players who didn’t perform well at the combine, so all this meat market really proves is that you can put anything on TV with an NFL shield and people will watch. Hand size is a ridiculous thing to judge a player on, even for a QB that handles the ball on virtually every offensive snap. It has no bearing whatsoever on whether he protects the ball any better than a QB with big mitts, and the whole myth has been debunked with good, old fashioned research and statistics. Furthermore, the archaic notion that a QB below six feet tall can’t see the field or is somehow at a severe disadvantage has repeatedly been proven false. Russell Wilson is a six-time Pro Bowler, and Drew Brees is the most prolific passer in NFL history. You know what they have in common? Neither stands above six feet tall, yet both have won Super Bowls and excel throwing the ball from the pocket. Locally, many Redskins fans revere the legendary Sonny Jurgensen, but don’t realize the Hall of Fame passer was just 5’11”. That didn’t keep him from lasting nearly two full decades in the league at a time when the vast majority of QBs were pocket passers, and all but decapitating the QB was permitted. Fran Tarkenton. Doug Flutie. Both looked like your next door neighbor, and both carved out pretty damn good NFL careers despite their lack of height. Even if you deem those QBs the exception and not the rule, the fact is there’s a helluva lot of very tall, very bad QBs, a good number of whom have been employed by John Elway, a Murray detractor because of his height. Shorter QBs are aided by the current trends in the NFL: Rules that overprotect the QB, offenses that employ the shotgun and read option elements, and more college-style spread formations that feature an overabundance of pass catchers on the field at any one time. QBs don’t have to be a tall drink of water to play in those schemes; they just have to be mobile, smart and capable of reading defenses. Murray displayed those abilities at Oklahoma, so if he doesn’t excel as an NFL QB, it won’t be because of his height or his hand size — it’ll have way more to do with where he lands. Which leads us to the inevitable question: What if he lands in Washington? With Alex Smith still on the mend, the Redskins have admitted quarterback is a position of need entering the upcoming draft, and Murray is definitely on their radar. 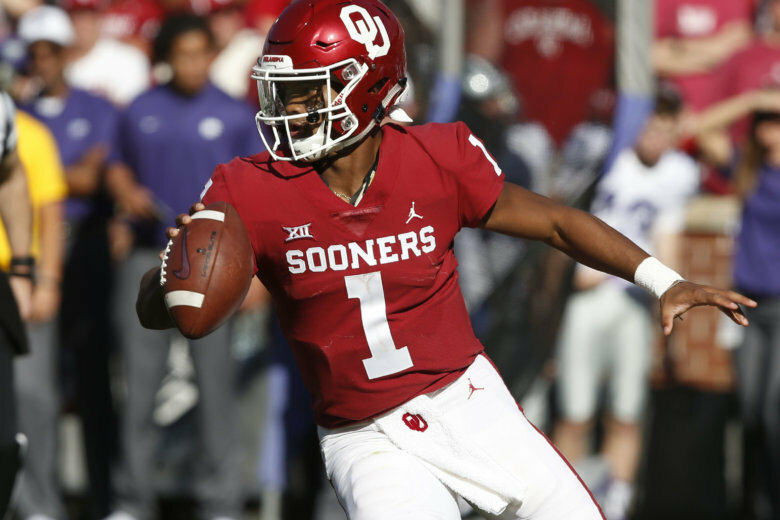 Bruce Allen said #Redskins have met with Kyler Murray and will meet with every qb here this week. The Redskins’ “QB friendly” scheme has elements of the read option, making it a good fit for Murray. But Jay Gruden isn’t exactly known as the most flexible coach out there, so it’s not a foregone conclusion that he’d fully cater his offense to Murray, especially since the organization remains misguidedly impressed with Smith and Colt McCoy. Then there’s the matter of whether Murray will be on the board when the Redskins are on the clock with the 15th overall pick. At least one mock draft has Murray going to the ‘Skins in that spot, but he could go as high as first overall, or his lack of height could drop him out of the first round altogether. Remember: Wilson was a productive college player with a skill set most teams liked, and his stature dropped him to the third round of the 2012 Draft. Given the Redskins’ need for a QB and the potential marketability of a player of Murray’s profile, there’s no way he slides past them. It looks like a good fit on paper, but as we’ve learned repeatedly in Washington, that doesn’t always translate to the field. This much is for certain: The only two things NFL teams can’t measure at the combine — the brain and heart — are the ones that separate the very best players from the rest of the pack.